This up-to-date compilation of topics on the maturity and changes occurring within facility management worldwide offers insights into the growth and development of FM and its impact on today's business organisations. Topics covered deal with the changes occurring in the field today and include key research areas for both academics and practitioners. 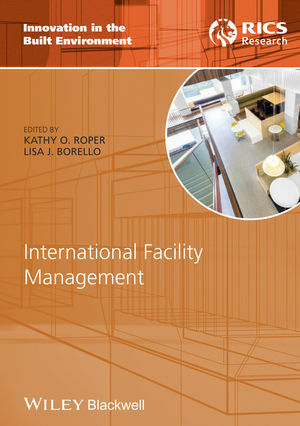 The focus is on actual practice of FM organizations – rather than on what FM should be - and the authors examine the latest techniques, models and case studies to provide a unique exploration of the new global world of facility management. Lisa J. Borello is an Editor and Grants Manager at Auburn University with more than 13 years of experience writing and editing scholarly and non-scholarly work. She is completing her doctorate degree in Sociology of Science & Technology at Georgia Institute of Technology. Kathy O. Roper is Associate Professor and Chair Integrated Facility Management at Georgia Institute of Technology where she teaches graduate courses in facility management, project management, and corporate real estate. Following a 23-year career in corporate, government and non-for-profit facility and real estate management, she is also co-founder and co-editor of the open access International Facility Management Journal.